Who's Behind The First 'Harry Potter' Café In The Country? It's owned by 23-year-old Nicole Guanio, who quit her corporate job and started the cafe with a P450,000 capital. The Nook Café opened its doors in Maginhawa just under a year ago. 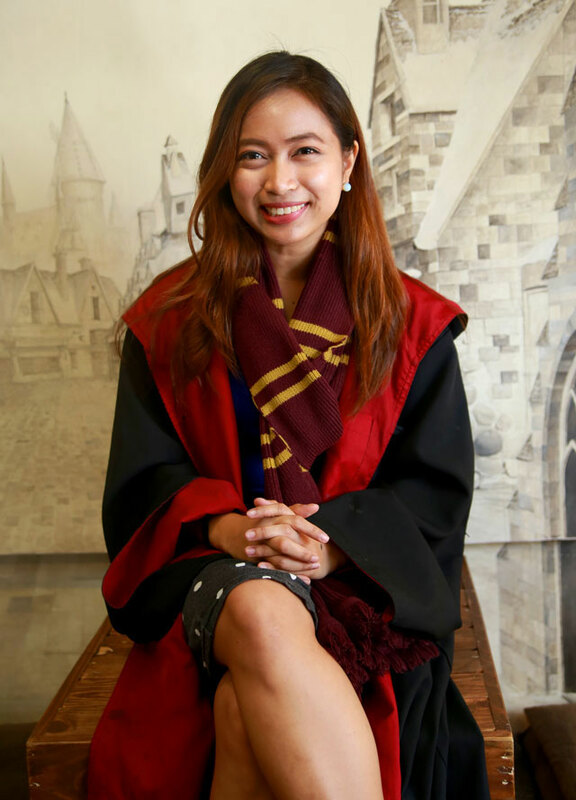 It is the brainchild of 23-year-old Nicole Guanio, whose love for books and Harry Potter led her to quit the corporate world. Tell us about how you first discovered Harry Potter. How did The Nook come to life? Because I was so young, I wasn’t reading the books at the same time everyone else was. Siguro mga 14 ako nung nabasa ko talaga yung Sorcerer’s Stone. Doon din nagsimula 'yung hilig ko sa pagbabasa. When I was 17, I dreamt of having a coffee shop where people can read, pero madami nang ganun eh. I really had to look for a competitive edge. Finally, something clicked at 3 in the morning and I just kept thinking, what if? Eventually, I planned a trip to Japan to visit The Wizarding World to come up with ideas and to try butterbeer! What was the process like for you? What were the first steps you took to make it happen? Ako lang talaga lahat! My family didn’t know about my vision, only a few friends. The reason why I kept it to myself was because I didn’t want to let any negativity in. Baka ma-discourage lang ako. Before, I really planned on just running the entire place on my own. I needed to know every process so I took barista classes. My mindset was all about minimizing the cost. I met someone in my barista class, who eventually became one of the friends I confided in, and she told me about an open spot in Maginhawa. I also conceptualized the two-story mural before anything else. 'Yun talaga 'yung nauna. Inisip ko na doon ko bubuhayin 'yung Harry Potter dream ko. In terms of financing your dream, how did you figure this out? It couldn’t have been easy! It wasn’t! I’m 23. I’m not capable of that kind of money yet. Thankfully, my family is very business-oriented. Everyone has a business kaya lang lahat sila nasa Mindoro so more on agricultural sila, ako lang talaga naiba. I was a marketing assistant at RCBC. I was also an investment banker at Thomson Reuters. So one day, I invited my dad to lunch to Makati. I had made a business plan, complete with all the resources for the café—architect, construction team, suppliers. I researched everything talaga bago ko nilatag kay daddy. I had to para seryosohin niya ako. My past jobs were good but I had no motivation, other than to earn. I was serious about my dream café. In the beginning, the entire cost of Nook was around P400,000-P450,000 lang. Malaki siya for a young entrepreneur pero compared sa lahat, hindi naman talaga, 'di ba? I really thought about who I could reach out to to keep my expenses low. 'Yung kasambahay ko, full-time employee ko na siya dito. Very thankful ako sa kanya. Siya talaga pinagkakatiwalaan ko dito. My cousin is one of my baristas. My friends contributed so much and I paid them well! As much as I would have loved to spend less, I also advocate artists. Hindi basta basta 'yung mga ginagawa nila. I’m an artist myself; I’m a dancer. When they invite us to perform tapos gusto lang nila magbigay ng free food? They don’t know about the studio fees and the long hours behind what we worked hard to show them. What do you find most challenging about running The Nook? You deal with struggles every day. I have to deal with bad feedback, even though I know I can’t please everyone. Hindi pa rin ako nasasanay. Masakit pa rin. The Nook is my baby. I’m the one who made almost everything possible. What we hear a lot is, “Ay, maliit lang pala siya.” That’s why it’s called “The Nook” and not “The Room” or “The Basement.” It’s a little corner. It’s in the name. One more challenge is nalulula ako sa expenses. It’s my first business. I also had trouble when one employee stole money from me. Can you imagine? Malaki na 'yung expenses mo tapos mawawalan ka pa? But aside from that, I’m coping well. I take it day by day and I learn from everything. It has to be the Bacon Wrapped Chicken. It was the first thing on my menu. Why? Everybody loves bacon! My lola helped me. What’s the best feedback you’ve gotten about The Nook? People have told me that they want to live here! And that’s everything to me, because it really says a lot about the entire place. They love the interiors, the food, the feeling of being here. And that’s always been my end goal. What do you have planned for The Nook? I’m going to add more features! For the chairs, I’m going to make the top—the part you sit on—into stacked books. I’m going to tweak some of the props we have. And I’m going to buy a brand new coffee machine! A really good one costs around P190,000. Kaya yan! I was fortunate enough to have my dad support me, but I really wanted to be as financially independent as possible because I was planning on buying some of the equipment with my own money. Before I resigned from my full-time job, I really held on to my last paychecks. Instead of eating out, I brought my own lunch. I stopped riding taxis. I didn’t waste money on expensive coffee. I avoided buying new clothes. I also did all my research while I still had a stable job. Every free time I had was spent finding suppliers, attending workshops in the weekends, and window-shopping for equipment. That’s my advice: Do as much as you can while you’re still working. Now that I run The Nook Café, my trade secret is how I train my employees. Customer interaction is one of the reasons why we’re doing so well. You must give your customers an experience they can’t forget. I wanted to break that barrier that some places have between the staff and the customer, because I believe that there should be no superiority. I protect my crew and I don’t want them belittled. And it actually works! Check out The Nook Café's Facebook and Instagram for more information.